I got hold of a copy of the CONSERVATION TRIBUNE’s SPECIAL EDITION of 25 JUNE 1996. Here is a bit of history to give us perspective on the current overpopulated elephant situation in the Kruger National Park. Many in the world conservation community were shocked and outraged when details of a recently signed accord between the South African National Parks Board (NPB) and the United Kingdom-based International Fund for Animal Welfare ([FAW) became public. 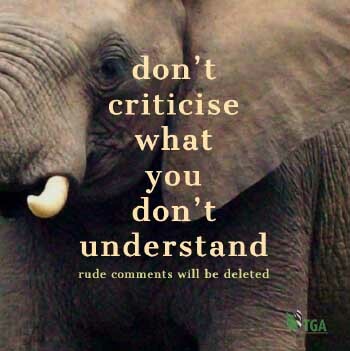 In the deal, NPB agreed to accept US$2.5 million (in five installments of $500,000.00 a year) from IF AW to purchase additional elephant habitat for Kruegar National Park on condition, among other things, that NPB expressly undertakes never to allow the culling or hunting of elephants or any other species of game on any land purchased by IFAW, in addition, the NPB undertakes not to submit a proposal to resume international trade in elephant products to CITES at the next COP meeting scheduled for 1997. In conjunction with the agreement, the Humane Society of the United States offered another US$2.5 million to the NPB to seek viable contraceptive for elephants. Eugene Lapointe, former secretary-general of CITES, roundly criticized the move, saying NPB had abdicated the sovereign rights of South Africa for a bowl of porridge. David Barritt, IFAW ‘s African director, defended the deal during the presentation of the first US$500,000 installment in May. He said IFAW was opposed to the Kruegar Park cull, in particular, because of its extreme cruelty. He said that IFAW has never accepted that the so-called sustainable utilization of animals. Many conservation groups are asking hard questions about the deal. What is the long-term impact of elephant translocation as the carrying capacity is exceeded in Kruegar and other national parks which have received its elephants? Simply, where do all the elephants go? How are the needs of humans met if the Kruegar expansion represents the first installment of massive wildlife set-asides in Africa? Africa Resources Trust based in Zimbabwe asked in an analysis of the agreement what benefits will be gained by South Africa. They see several dilemmas ahead, not the least being IF AW using the program for propaganda purposes and enforcing the terms of the agreement with negative publicity and misleading information. According to experts, if the elephant population is allowed to increase in Kruegar and on newly purchased land, there is ample evidence that serious damage will occur. They claim that prudence dictates that it is not wise to wait until extensive damage is done to vegetation and other wildlife before control measures are initiated. But the most fundamental question about the deal has been raised by international law experts: how could NPB sell its country’s Sovereign Rights by subjecting its decisions – on national and international policies -to the approval of an entity, IFA W, which is in no way part of the democratic process of South Africa? What are South African National Parks Board·Rights? All humans are born with fundamental rights that most constitutions fully recognize and protect. 0nly the holder of these rights can waive them, or accept, that they be limited. Governments are institutions formed to serve and protect human interests. Together, governments and their citizens comprise Sovereign States. Inherent to these States are rights which are called Sovereign Rights. These are fundamental to each nation within the international community. To preserve them, only the political system within that nation can decide on behalf of its people. These rights cannot tolerate outside interference. They can, in 110 way, be waived, diminished or reduced. They are fully recognized and protected by international law. These rights are so highly guarded that wars have been fought over them. To abdicate these rights to institutions outside the democratic and legal process of a nation ca11 be construed as a crime against the people. While it isn’t THE biggest fish in the political pond, it will be a prized trophy proudly hung on the wall all the same. The International Fund for Animal Welfare made an impressive catch when it reeled in the National Parks Board (NPB) of South Africa with a tidy stack of greenbacks. Not only did NBP swallow the bait, they thanked IF AW for the privilege of being hooked. The political fish weren’t biting in Namibia and Zimbabwe so IF AW paddled south and cast again in another corner of the pond, said world-class piker Snagum N. Reelum. 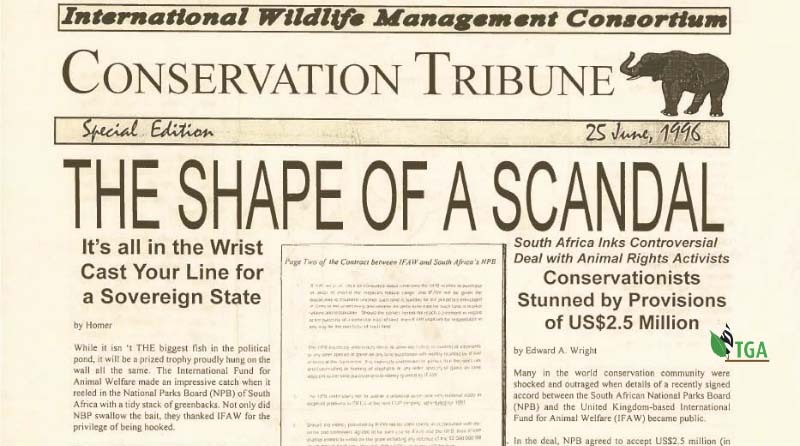 IFAW threw in an impressive line of promises wrapped in cash and the South African National Parks Board swallowed hook, line, and sinker. IFAW knows there isn’t much challenge to political angling in Europe and America, so like any self-respecting trophy hunter, they moved on to more elusive conquests. In this contest, it’s not sporting to stalk game you already have in the corral, but for quarry that commands shrewd determination with a pinch of intrigue thrown in. FA W had so much luck on its political fishing expedition in Africa that the Humane Society of the United States (HSUS) is now trolling NPB with its own bundle of goodies. HSUS is pulling a different tack, though. They are wrapping their bootie around contraceptives in hopes that Africa’s wildlife are reduced to truly endangered status, thus eliminating competition for their sentiments. After the splendid haul, IFA W’s excursion leader announced an official opening of the political fishing season. He admonishes those planning similar expeditions to plan early. Large crowds and heavy traffic are expected now that IF Aw· s trophy has been proclaimed. At last word, environmental and animal rights zealots were seen frantically paddling across the globe in search of the next world-class trophy.